Recently I wrote an article with Hephzi Pemberton busting the most common misconceptions people have about science, technology, economics and mathematics (otherwise known as STEM). One of the main issues Hephzi finds in her work as an equality expert and founder and CEO of Equality Group is the belief that men are better than women at STEM. Though this may come across as exaggerated or purposefully provocative, the facts stand with this statement. The UK remains one of the worst regions in Europe when it comes to encouraging women into STEM roles. Currently, only 24% of UK STEM roles are held by women and the country has the lowest percentage of female engineers on the continent. As with any societal prejudice, the roots begin to take hold at home and must be weeded out in childhood if the problem is to be fully rectified. That’s why we need to find ways to involve young girls more readily in conversations about STEM and get them excited in a future career in this area. When speaking to KinderCare – the USA’s largest early childhood education and childcare provider – I was informed that over 65% of today’s students will end up in careers that don’t exist yet; careers that involve technology and its advancement. So it’s more important than ever to make sure all children – not just boys – are given the opportunity to get excited about this area of learning. Dr. Elanna Yalow, the Chief Academic Officer at KinderCare (whose own mother won the 1977 Nobel Price for Physiology or Medicine), alongside her colleague Theresa Maves, put together a few tips that can be implemented at home or school to help get young girls more excited about STEM. If you’re reading a book about a famous female scientist, detail all the things the character and your child have in common. If you’re watching a show that only shows male characters in STEM careers like a mechanic, doctor, or computer engineer, point out other female characters your child is familiar with or the family/friends they know who have similar careers or hobbies. Some great examples to look at include Jane Goodall, Mae Jemison, Katherine Johnson, Shurouq Al Hamaideh, or Dr. Rosalyn Yalow, the 1977 Nobel Laureate in Physiology or Medicine. This process can help broaden a child’s understanding of the roles and opportunities available to them. Remind girls that STEM doesn’t only live in a laboratory, research centre, or technology company. Technology can be used to draw or create music or conduct research. As girls use technology to pursue other interests, it may open a whole new world of possibility for them and channel that interest into a future career in STEM. And if your child shows a particular interest in specific STEM-related subjects – the universe, the ocean, robotics, etc. – find nearby activities that you can do together as a family to show that you’re listening and eager to learn more. Think about simple ways to make these activities even more engaging and exciting to build on their initial interest, like asking keepers at the zoo about your child’s favourite animals or researching how forests grow before your family camping trip to see how different ecosystems work. If your child has a fondness for “Frozen” or “Cinderella,” you can transform their favourite movies into lessons on temperature or carriage design. The most important role model a child has is their parent, so if you’re excited about a subject, your kids will be too. Instil confidence in children by praising the process, not just the outcome. Your child’s greatest happiness and success will come from pursuing their instincts, passions, and interests, so encourage them to explore what they show excitement about, even if they stumble and struggle along the way. Think about focusing compliments around desired behaviours – working hard, trying something new, perseverance, showing grit, and learning from our mistakes – to teach them success doesn’t come from always being right. Kids need to believe that it’s ok to fail, so they’re not afraid to try. And sometimes “accidents” or “mistakes” end up leading to great solutions – just look at penicillin. Emphasise the skills that underlie STEM fields, such as curiosity, observation, problem-solving, critical thinking, collaboration, creativity, and communication. Some of the best words to use with children when they’re asking a question are “Why?” “How?” and “What If?” By giving your child an opportunity to explain the world they see instead of telling them all the answers, you’re helping spark curiosity for activities and ideas in STEM and beyond. And by developing these skills in young girls, you set the foundation that they can refine and channel into more formal STEM training. Reinforce that kids, and especially girls, shouldn’t be limited by traditional gender stereotypes. Make sure children know they can do and try anything that captures their attention and passion and try to refrain from saying certain toys or items are specifically for boys or girls. Trucks, dolls, dinosaurs, kitchen sets and tool boxes are amazing tools for all children to play and explore with. New toys can help kids have fun with STEM, including robots that can be programmed to deliver packages or that can create a drawing. Try not to set boundaries on a child’s imagination so they can understand the possibilities for the future. 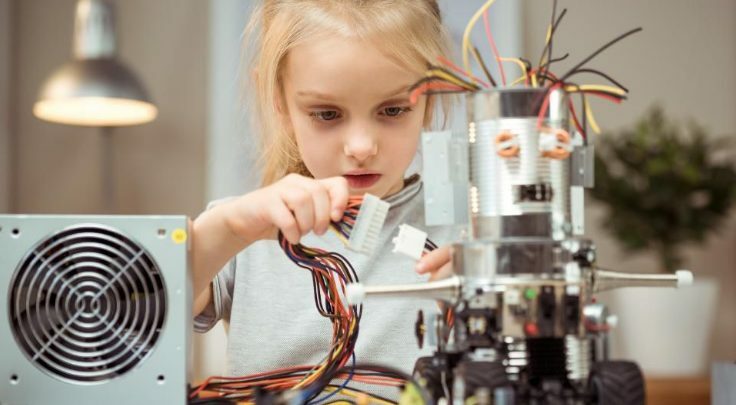 Providing young girls with early STEM experiences ignites their interest at a young age, often before they are impacted by gender defined stereotypes that may try to channel them in different directions. We often unknowingly and unintentionally encourage young children into stereotypic roles by decisions we make on their behalf that play into traditional expectations; being aware of that tendency is the first step in changing our behaviour to give them all the opportunity they deserve. Clearly, not every young girl will be interested in a career in STEM but this is beside the point. Engaging them in the area will ensure they make informed decisions about their life choices and “engage in informed debate” with their peers.